The medico-surgical speciality of anaesthesia and resuscitation is relatively recent, with narcosis having been achieved by its pioneer Horace Wells for the first time in 1844. Major BAUDENS, a surgeon in the French army of Africa (behind the creation of the School of Medicine in Algiers in 1857) developed general anaesthesia using chloroform during the conquest of Algeria around 1850. He provided a precise description of how it could be done; he continued to use it during the Crimean campaign, along with others such as naval surgeon Auguste REYNAUD, the inventor of the chloroform cone-shaped mask. Much later, closed-circuit anaesthesia was introduced to the French army of Africa when American practitioners trained 77 anaesthetists posted to the various corps of the health services; besides learning how to use the closed circuit, they also learned to use Pentothal and this pentothal-based technique spread abroad after the war. Chippaux, a military surgeon, reported the experience of a Tafilalet advanced surgical unit in the Moroccan village where a certain Mademoiselle Lafourcade had recounted her experience of 104 patients successfully anaesthetized with Pentothal, anaesthesia being carried out by Moroccan nurses trained on the spot. However, it was important to consider the particularities of anaesthesia and resuscitation in tropical zones. In these countries, the practice of general anaesthesia cannot be the rule, which was why it necessary to use local anaesthesia, with spinal anaesthesia being the most sophisticated type. Between 1945 and 1952, the extremely intelligent and clairvoyant Naval Surgeon Henri Laborit, realized the interest of neuroplegia and developed its applications: potentialised anaesthesia and artificial hibernation. Neuroplegia, associated with filling, is used during sanitary evacuations for casualties awaiting a surgical operation. Laborit initiated new concepts and methods which had important repercussions on the principles of modern resuscitation as well as on therapeutics in psychiatry, thanks to his discovery of chlorpromazine. During the Algerian war, the first notions of anaesthesia and resuscitation developed before the war were put into practice (Medical Commander Duchesne). Introductory courses in these techniques were organized at the Ecole d'application (training centre) of the military health service. The Medical Commanders Gaujard and Picard taught their concept on new anaesthesia equipment and resuscitation techniques, and these same concepts were behind the SAMU-type structures which developed in France under the influence of P. Huguenard. During the Crimean war, some particularly bloody battles were waged such as the battle of the Tractir bridge on 16 August 1855. Many of the casualties were taken to ambulances where operations were performed under anaesthesia, which found its place for the first time on a battlefield and also in the history of medicine. It was thus that the sailors introduced their brothers in arms from the army to the use of the chloroform cone-shaped mask. Up until then, only laudanum and alcohol, along with the deft hands of the surgeon, made it possible to allay the pain of the wounded. 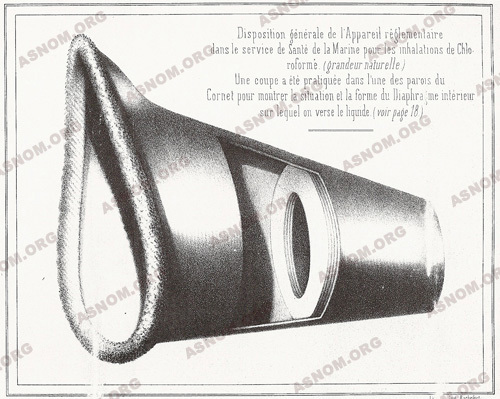 The chloroform cone-shaped mask, invented by naval surgeon Auguste Reynaud from Toulon, was fourteen centimetres high, made of thick cardboard with a large opening in its base to fit tightly between the two protuberances of the chin and the nose so that the nostrils and mouth were located in the middle. In the shape of a truncated cone, it had a four centimetre opening at the top and was divided in the middle by a diaphragm made of thick cloth disks for receiving the anaesthetic, in this case chloroform. Easy to use and compact as it could be folded, this cone was to become regulatory issue in the navy in 1856. Later, the cone-shaped masks used by the great naval surgeon Jules Fontan would be made of metal, and therefore could be sterilized. This inter-army cooperation was exemplary on the battlefield and had been emphasized by Surgeon in chief of the army Scrive: "It was the best of relationships at all times between the naval physicians and our own physicians. These circumstances of technical collaboration, added to the many contacts between the navy and the army associated in this war, will have the effect of tightening even more the fraternal link which unites the military doctor with the naval doctor". This is carried out in a specific climate which has repercussions on the general health of the population, the equipment and the drugs. These climate conditions can trigger two syndromes: heat stroke and severe dehydration. Moreover, the equipment deteriorates and oxidizes faster, and gaseous and volatile anaesthetics are particularly heat-sensitive. In the bush, the technical means and environment are very limited in terms of power supply, the quality of the technical apparatus or its adaptability to the environment, stocks of oxygen or gas are often insufficient, and the lack of further examinations that can be carried out make it even more difficult; lastly, the nursing staff is either insufficient or inexistent. Patients often suffer from malnutrition, parasitosis, or hemoglobinopathy which can affect anaesthesia. In these conditions, it is best to use the safest and simplest techniques which can be applied by nurses who have been well-trained, both from a theoretical and a practical point of view. For a long time, these techniques were developed or taught by surgeons who trained their nurses on the spot. Since the early 1960s, many African anaesthetists and nurses have been trained, some of them directly in hospitals in Africa, such as the Hôpital Principal de Dakar, others in Laveran and Le Pharo in Marseille; thus several hundred nurses have passed their anaesthetist diploma in partnership with the hôpital Nord in Marseille. They have come from all the French-speaking countries of Africa. Some doctors and nurses have come from Asia (Vietnam, Laos) to learn this specific practice and upgrade their skills. - Anaesthesia techniques adapted to tropical zones. - The resuscitation of people with severe forms of malaria. - Chloroquine intoxication, particularly frequent in Africa. - Heat stroke and hypothermia which represented a research theme which is still followed in mainland France to date. It is therefore often impossible to carry out anaesthesia by inhalation, except in urban centres as there are no specific evaporators, the products are expensive and it is difficult to store them. Intravenous anaesthesia techniques use narcotics of which the most used have been Pentobarbital and ketamine. However, in an isolated post or in a small bush hospital, doctors can only use these techniques on the rare occasion. Therefore general anaesthesia is not generally used and doctors use spinal anaesthesia whenever possible. Spinal anaesthesia has certain advantages over general anaesthesia. Used for the first time at the end of 19th century, it consists in performing a spinal tap, in complete asepsis, in order to introduce an anaesthetic product into the cerebrospinal fluid (the spinal tap dates back to 1891). This is an extremely simple technique which results in an almost immediate anaesthesia that lasts for around two hours. Considering the roots anaesthetized, this is appropriate for operations below the navel: obstetric operations, caesarean sections, particularly emergency operations, abdominal, gynaecological or perineal operations, operations on the lower limbs. Spinal anaesthesia is a simple anaesthesia method for any operation to be performed on the lower half of the body, but it is not, however, free from danger. Apart from causing lasting and painful headaches, frequent nausea and vomiting, it can result in low blood pressure which can be extremely serious and must be carefully monitored. This form of anaesthesia allows the doctor in an isolated post to treat the large number of emergencies with which he is faced. Henri Laborit, the son of a colonial doctor, born in Hanoi, entered the Ecole de Santé navale in 1934 and served in the French navy. After his internship, he became a surgeon, and turned rapidly towards improving anaesthesia and protecting those on whom he operated from shock, and it is for the studies he carried out in this field that he is known all over the world. After the Second World War, he advanced the idea that shock causes the body to overreact, resulting in possible heart failure and even death. This concept was developed from research by R. Leriche on post-operative disease and research by H. Selye who had described the 'the general adaptation syndrome' (a neuro-endocrine reaction to the alarm or 'stress' syndrome). Laborit's idea was to block the exaggerated response of the vegetative nervous system, using a mixture of medication, known as lytic cocktails; these were initially based on phenothiazine, promethazine (Phenergan) an antihistamine with sedative, cholinergic and adrenolytic effects, and diethazine (diparcol), a vagolytic, associated with a ganglioplegic and an analgesic. Inhibiting the organic reaction to attacks by using lytic cocktails made it easier to perform anaesthesia, in its components of sedation, analgesia and 'potentialized anaesthesia' narcosis. Moreover, associated with refrigeration, it results in a state of hypothermia known as 'artificial hibernation' which makes it possible to perform major surgery particularly in the case of cardiac surgery. From 1952, promethazine was replaced by chlorpromazine (largactil), whose exceptional properties were detected by Laborit in the treatment of shock and for its relevance in psychiatry. Chlorpromazine thus became the leading neuroleptic and was introduced in psychiatry and justified a congress in Paris under the authority of Jean Delay. These studies on chlorpromazine earned Laborit the Albert Lasker Prize in 1957 for the treatment of shock and to Deniker (from Delay's team) for its application in psychiatry. In 1953, Laborit was sent on a mission to Indochina, accompanied by P. Huguenard, to observe the use of his pharmacological methods in war zones, methods that Colonel Doctor Chippaux had coded to adapt them to the collection, evacuation and treatment of the wounded. During this mission, Huguenard had been able to observe the advantages of medical evacuation by helicopter. As he wrote in 1999: "It was thus that Laborit was directly responsible for transport under sedation and, indirectly, for using helicopters for these transports organized by the SAMU". Introduced to biochemistry by Pierre Morand, a naval pharmacist and chemist, Laborit dealt with cell and tissue rebalancing from a metabolic and hydro-electrolytic point of view. For patient resuscitation, he had the idea of providing a sufficient amount of hypertonic glucose associated with insulin and potassium chloride which was easy to use at cell level. The 'polarizing solution', used in cardiology to treat myocardial necrosis was met with world-wide success. On leaving the Val-de-Grâce in 1958, Laborit set up in his laboratory of Eutonologie in l'hôpital Boucicaut; there he was to create and develop several pharmacological substances such as potassium and magnesium aspartates, Gamma-OH or Minaprine/Cantor. His personality and influence were perhaps not sufficiently recognized by the institution for which he worked, but were acclaimed enthusiastically abroad where he was named doctor Honoris causa by a number of universities. 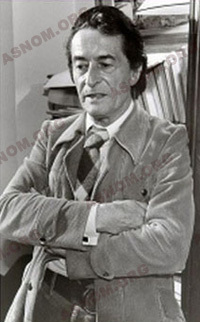 The author of many works and hundreds of publications, and sometimes pamphlets, but always a true writer, he inspired the film Mon oncle d'Amérique (My American Uncle) directed by Alain Resnais, was acclaimed by the public and was awarded the Prix Spécial du Jury at the festival de Cannes in 1980. The film focuses on the evolutionary psychology regarding the relationship of self and society to which Laborit had contributed. Laborit was something of a non-conformist and incapable of complying with hierarchical constraints, yet he achieved work which affected modern anaesthesia and has considerably influenced treatments in psychiatry with a new philosophical approach. - Courtine J.Cl. L'Armée d'Afrique et l'anesthésie réanimation : de Baudens (1853) au Corps expéditionnaire français à la Première Armée (1942-1945) et à la guerre d'Algérie. Communication présentée à la séance du 10 décembre 1983 de la Société française d'histoire de la médecine. - Laborit H. L'anesthésie facilitée par les synergies médicamenteuses, Masson éd., 1951. - Laborit H. Réaction organique à l'agression et choc, Masson éd., 1952, 2°éd.1955. - Laborit H. Bases physio-biologiques et principes généraux de réanimation, Masson éd., 1958. - Huguenard P. De l'anesthésie potentialisée aux SAMU. Communication aux « Journées Henri Laborit », Rochefort, 8 et 9 mai 1999. - Clervoy P. Payen A. Corcos M. D'où sont venus les premiers neuroleptiques ? Perspectives psychiatriques 2001, 40, 2, 133-138.